Is it that I'm too busy outside watering to post any gardening pictures? I haven't posted any since the beginning of July so here's what has been blooming since then. 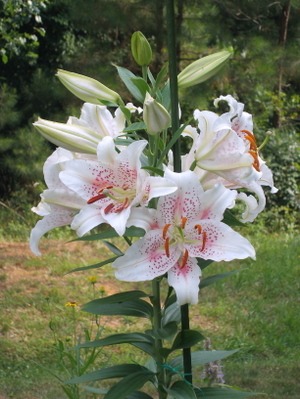 This lily is one of my favorite flowers of the entire year. I stop and look at it frequently while gardening. The bed in the side yard. 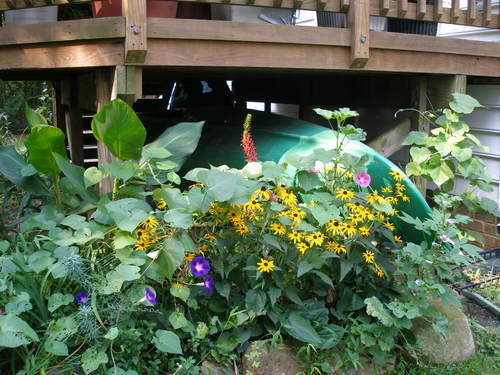 Purple Bee Balm on the left with Cabbage Leaved Rudbeckia in front of it. 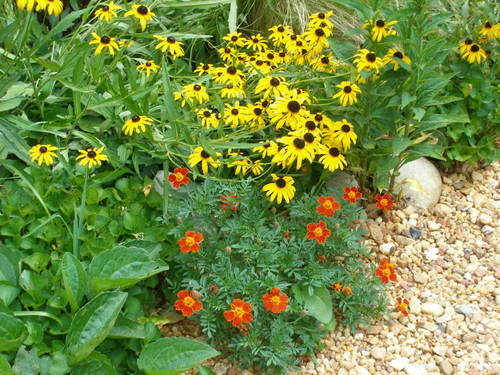 Daisies and Black-Eyed Susans in the center, and the lily with Petunias and Bunny-Tail grass on the right. 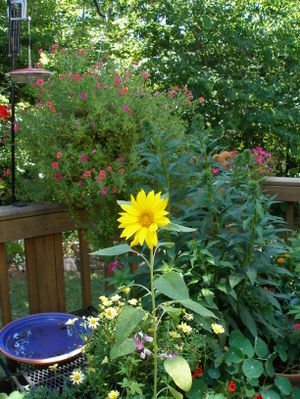 A volunteer sunflower which came up on its own in one of the flowerpots on the deck. I'm glad I took this picture because it fell over in a thunderstorm the next day. 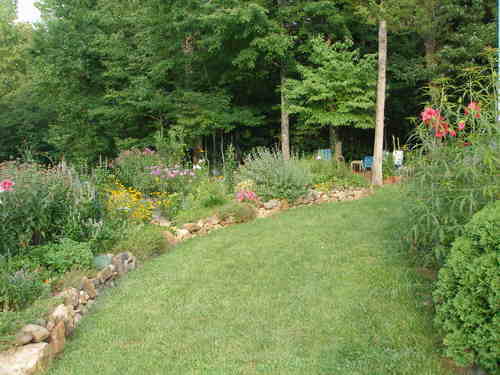 The side yard from another angle. The lily is done blooming. 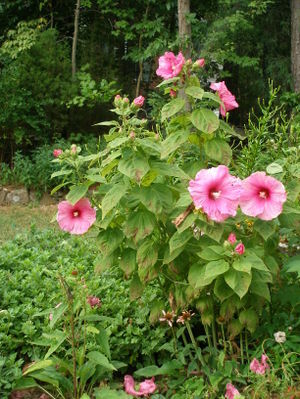 Another one of my favorite flowers, though I don't know its name. We've had it since we moved from our previous house (along with about 20 to 30 pots of other plants). I call it the pie plate hibiscus. It has one problem. It starts blooming when the Japanese Beetles arrive, and it's a favorite of theirs. They actually crawl into the buds and eat holes in them before they even start blooming. 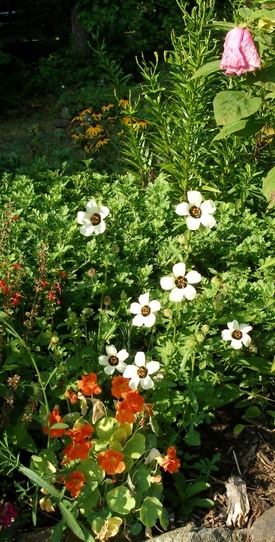 A small, white hibiscus with nasturtiums. The second bloom for the Delphinium. 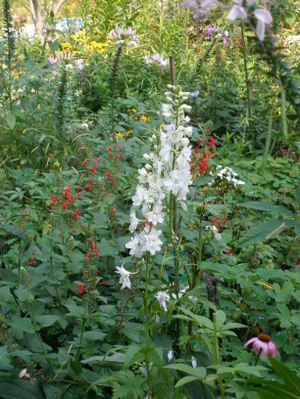 Cleome (Spider Flower) in the back, Lady in Red Salvia behind the Delphinium, and a Cone Flower in the lower right hand corner. Unexpected beauty. This is the tail end of the bed behind the deck. Things I deliberately plant there don't survive so these are things that either spread into the space or the seeds fell here. So beautiful! 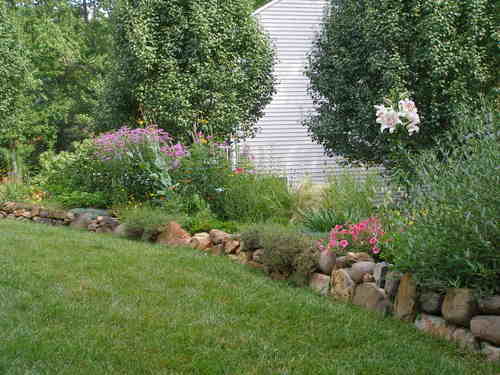 I just love looking at your garden pictures. Very nice pictures,So beautiful.I love these and wanted to make our garden like this.and also uses the outdoor light for more decoration. What wonderful pictures, It looks like a delightful garden. When I wanted to light my garden up I used solar lighting as this looked a lot better than normal lighting and was much easier to install.